Congratulations to Qin Huang for passing his Qualifying Exam on January 18, 2016. 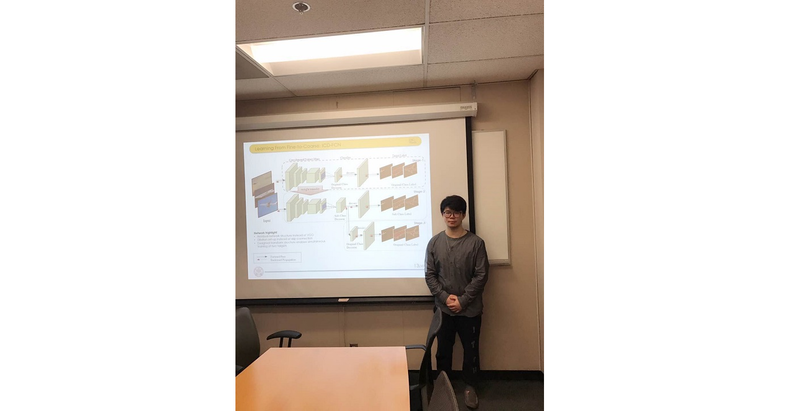 The title of his Ph.D. thesis proposal is “Machine Learning Techniques for Perceptual Quality Enhancement and Semantic Image Segmentation”. His qualifying exam committee consisted of Jay Kuo (Chair), Antonio Ortega, Justin Haldar, Sandy Sawchuk and Cyrus Shahabi (Outside Member). Researches on image processing and computer vision problems can be generally divided into two major steps: extracting powerful feature representations and designing efficient decision system. Traditional methods rely on hand-craft features, as well as pre-defined thresholds to generate a necessary condition required for the desired target. A more robust system could be designed taking advantage of machine learning techniques if enough training samples are provided. Thanks to the development of big data, millions of image and video contents are now available for training. To better utilize the information in the training, convolutional neural network based deep learning systems become popular in recent years. Specifically, the CNN based methods demonstrate better ability to acquire powerful feature representations in a simultaneous way. However, CNN based training has a high requirement of hardware and subtle process design. And therefore it should be carefully explored in order to obtain desired results. In this proposal, we contribute to three works that gradually develop from the traditional method to deep learning based method. Based on the applications, the works can be divided into two major categories: perceptual quality enhancement and semantic image segmentation. In the first part, we focus on enhancing the quality of images and videos by considering related perceptual properties of human visual system. To begin with, we deal with a type of compression artifacts referred to as “false contour”. We then focus on the visual experience of videos and its relationship with displaying frame-rate. In the second part, we target at generating both low-level detail segmentation and high-level semantic meaning on given images, which requires a more detailed understanding of images.